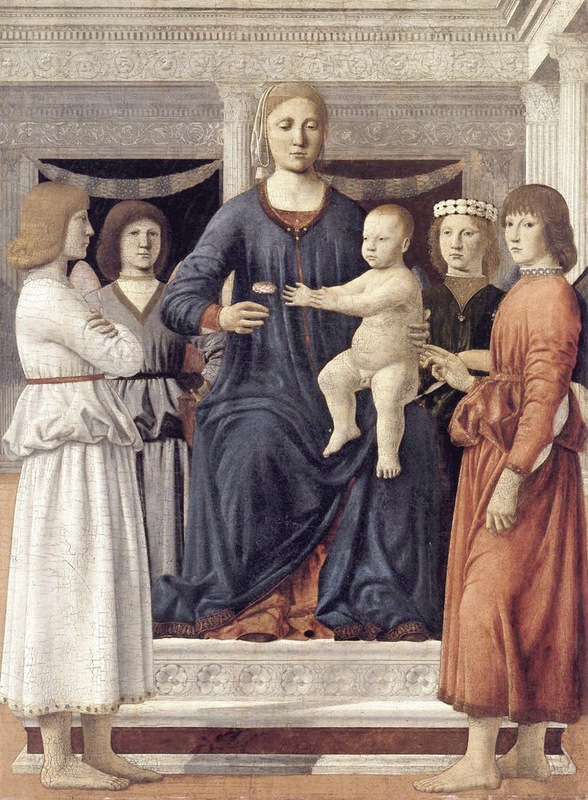 Piero della Francesca has been hostage to changing fortunes. In his time, Duke Guidobaldo (who was immortalized in a portrait by Raphael) called him the "prince of modern painters." He is also honored with a chapter in Vasari's Lives of Artists and credited there with being the greatest geometer of his time, in addition to being a great painter. Soon after, however, he drifted into veritable neglect. In the Anglophone world, he was mentioned only passingly until the 19th century when he caught the attention of Charles Eastlake, first director of London's National Gallery. By the turn of the 20th century, he had something of a cult following, with monographs written on him, and lectures by Roger Fry, who is also credited with bringing both post-impressionism and African art into British and American consciousness. Under Fry's influence, Piero's fame grew steadily. Modernists saw him as a precursor to their art and, in 1925, we find Aldous Huxley calling Piero's Resurrection (above), "the best picture in the world." Interestingly, Roger Fry's affection in Piero predates his discovery of post-impressionism, and may owe more to the influence of the Pre-Raphealites on British thought. 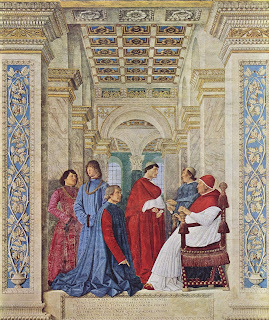 Though they never championed Piero, the Pre-Raphealites drew attention to the spiritual austerity of quattrocento painting, and few artists realize their ideals better than Piero. Thus, we can find a path from the Pre-Raphealites to Fry, and then from Fry to modernism. On this telling, Piero becomes a bridge that allows English art enthusiasts to develop an appetite for modern art. New York is lucky to have a Piero exhibition right now at the Frick Collection. 7 works are displayed--the largest number ever grouped together in North America--including 6 panels from the Sant'Agostino altarpiece, which are normally scattered in different collections around the globe. 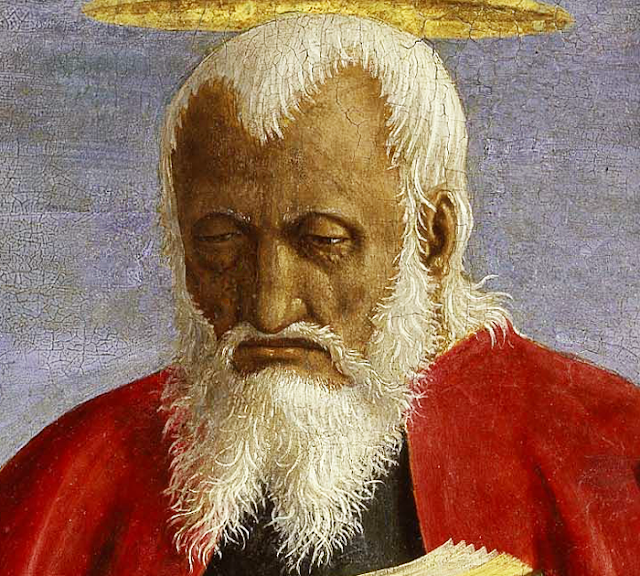 The alterpeice paintings include two austere portraits of a monk and a nun (above), as well as two full body portraits: a gorgeous St. John the Evangelist (owned by the Frick), and an imposing St. Augustine with a passion play decorating his robe. Seeing these together is a special thrill. The exhibit also includes a stunning Virgin and Child Enthroned with Four Angels. Like much of Piero's work, it can be described as movingly still. The figures are erect and calm. Their faces are classical, mask-like, and composed. Most are looking inward, the Madonna's eyes are downcast and Luinesque, but the figure on the right looks out at the viewer, while pointing to the Christ child. 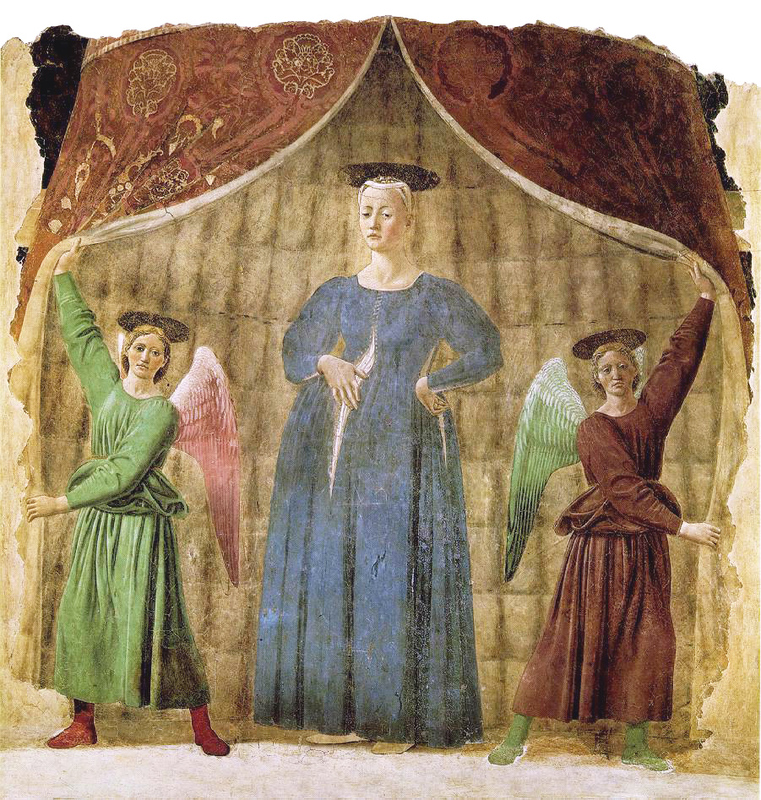 These angels lack the drama that is so characteristic of High Renaissance art, and this gives them a quiet humanism that is more affecting than works by many of Piero's successors. The Virgin here has a quiet nobility. She is like an ancient stone goddess, securely perched in the center of the canvas. Piero's Mary paintings are among the best in the history of art. Two others, both highly unusual, are reproduced for comparison to below. 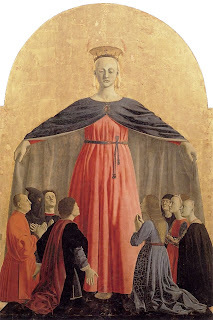 All three Mary paintings have Mary at the center, towering comfortingly above the other figures. The Mary exhibited at the Frick also exemplifies the trait for which Piero has become most known: his inventive use of geometry. Piero wrote an important treatise on perspective, bringing that technique to a new level. We see a hint of that in the upper right. More strikingly, this painting, like many of Piero's most famous works makes extensive use of hidden formal regularities. If one creates a square using the upper border of the panel, the midpoint will coincide with the outstretched hand of the Christ child (above left). And if one creates a square using the architectural element in the background, its midpoint coincides with the hand of Mary, who is holding a rose (above right). The upper-right quadrant of that inner square contains the heads of both Mary and Christ, and the crown of Christ's head falls at the midpoint (a device used in other Piero paintings). Further decomposition of this square reveals many other precise alignments. I created a grid to illustrate (above). All four angels' faces have central points that line up with one of the nested verticals. Two angels have v-neck garments that align with verticals, and their robes also align. Christ's and Mary's legs alight with other verticals. The head's of christ and two angels align with one horizontal line, and that same line intersects the hairline of the other two angels. The horizontal below that touches all of their chins. The next horizontal hits the base of Christ's art and the base of the aforementioned v-necks. The one below that intersects with Christ's knees as well as the belts of the two angels that flank either side of the panel. Below that, a horizontal catches the hemlines of those two angels along with Mary's knee and Christ's foot. These are just a few of the hidden geometrical coincidences that contribute to the painting's sense of harmony. Highly formal but never cold, Piero's geometry is humanizing. To fully appreciate Piero's poetic humanism, one need only consider his two most distinguished pupils. First consider the above painting by Melozzo da Forlì. It has Piero's stillness and it takes his use of perspective to a new level. But it utterly lacks the gentility of Piero's lines, his touching facial expressions, and his subtle palette. Piero's other distinguished student is Luca Signorelli, famous for complex compositions with many interlocked figures. For comparison, look at Signorelli's Last Judgment in comparison to the most figurally complex Piero that I know, The Battle of Heraclius and Chosroes. Even in battle, there is a stillness to Piero's figures. Signorelli's are highly theatrical in comparison. There is hardly a vertical body in the painting. 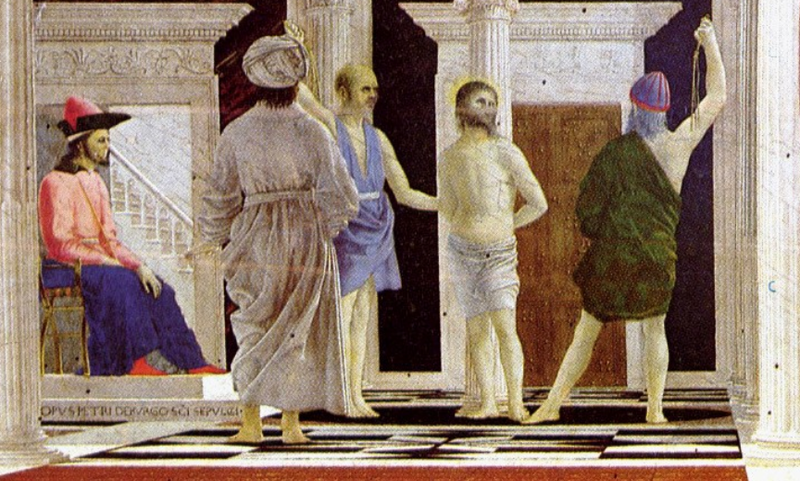 For a final comparison, consider this Signorelli Flagellation in comparison the Piero's treatment of the same theme (which is just a detail from the background of a larger composition). Seeing these side by side it is hard not to think, with the Pre-Raphaelites, that the Renaissance took a wrong turn after Piero. The serenity and dignity of his work was replaced by much cartoonish melodrama. Signorelli is magnificent, to be sure, but his embellishments signal the loss of something very special, something that is present in much medieval art but gets lost as painting became more ostentatious. Ironically, the High Renaissance painters are regarded as humanists, but Piero's work makes Michaelangelo and Titian look vulgar. In this light, Piero's great contribution is not the he pre-figured modernism, but that he is pre-modern. He gives us noble human archetypes at a moment just before humanity arrogantly asserted itself as the measure of all things. why are his paintings of Mary considered the best in history of art? What makes them the best? if it would not be indicated in Virgin and Child Enthroned with Four Angels that she is Mary, I would not know. She does not look like other Mary's. 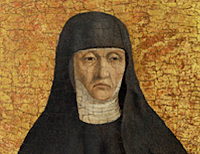 You can barely say she has an expression in this painting. Whatever that is, it is a peaceful and content one. the child is what is striking in the painting. he does not look like a proper child, his position is awkward and he gives the feeling that it is a mature thinking person in the body of a child. 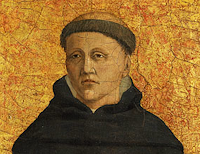 his expression is more clear then of the other characters in the paintings. more grounded. I do not think the characters are looking inward. or so it seems to me, I might be wrong though. art is tricky. The first painting, that man looks depressing reading that book. Must be the Bible, for what is worth. There is no hope. and about geometry. in photography, at least, things are changing. bresson was focused on geometry and sensitivity as capturing the decisive moment. but geometry can be simple or it can get complicated. it should be simple first though, no? the artist, in general, is defying the bare notions of geometry. Just for the sake of it?